Want to entice more feathered friends? Better than any birdhouse or bird feeder, bird baths really do the trick. Fresh water is very appealing to many species, even those who may never visit a feeder or use a birdhouse.The water element is in fact the most crucial one when creating a wildlife habitat. 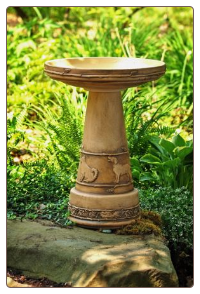 If you fancy the nicer things in your garden, there are pedestal type bird baths that are still crafted the old fashioned way by talented artisans. Fine clays are used to create elegant designs, many are even hand painted. The Best Friends Bird Bath shown at left features an intricate relief of cats and dogs. The character is charming, and you can be sure birds will love it too! With a patented locking lid system for added stability, this bath will last for many seasons of use. 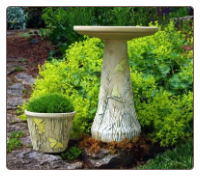 Although the production methods differ significantly they share certain features – an emphasis on quality, craftsmanship, and attention to detail, offering beautiful, American-made bird baths and garden decor. It’s difficult to convince folks sometimes, and all the blogging in the world may not make a bit of difference. But when the Associated Press does an article on the benefits of backyard birding…it seems a bit more substantial. 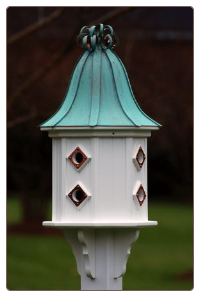 Bluebird houses have been proven beneficial in the fight against unwanted insects. Much better than ineffective pesticides, most of which have been rendered useless….read on! Growers are beginning to understand that common birds can be of uncommon value to fields, lawns and gardens. Many avian species earn their keep by eating insects and small mammals, and destroying weed seeds. That means mimicking nature by providing plenty of food, water and cover. Put up some bluebird boxes or nest boxes for raptors, said Marne Titchenell, a wildlife specialist with Ohio State University Extension. Birds occupy a unique place in nature, according to the authors of a timeless 1912 study, “Red Bird, Green Bird: How Birds Help Us Grow Healthy Gardens,” by Harry A. Gossard and Scott G. Harry (Ohio State University Extension, revised edition 2009). “Each species performs a service which no other can so well accomplish,” the authors said. Raptors such as hawks and owls chase down field mice, moles and grasshoppers. Insectivores like bluebirds, chickadees and woodpeckers stalk beetles, worms and grubs. Meadowlarks are ground feeders, favoring meadows and farm fields where they gorge on grasshoppers and weevils. Robins focus on lawns and gardens, where they pull up cutworms, wireworms and other larvae injurious to crops. Chickadees are birds of the forest, eating tent caterpillars, bark beetles and plant lice. Goldfinches prefer open country where they can pursue caterpillars and flies. “No other bird destroys so many thistle seeds,” the authors say. While it’s great to have these specialized bug hunters around if you’re a grain farmer, small commercial farmer or orchard grower, recruiting should be directed toward a variety of species, said Margaret Brittingham, a professor of wildlife resources at Penn State University. The backyard birding experience is about watching wild birds, their behaviors and songs, and their interactions in the habitat you’ve provided. At times it can be captivating, watching nature thrive, close up in your yard. It can literally “take you away” from the day-to day mundane, to the extraordinary. Maintaining feeders is large part of this great hobby – cleaning and filling them. It’s the responsible thing to do if you’re attracting birds to gather in rather unnatural groups and eat from these feeders. If you’re looking to spend less time filling and more time viewing, hopper bird feeders are a perfect choice. Hoppers tend to hold more seed than tube type feeders. Large capacity hopper bird feeders will entice a good variety of species as well. Just about any kind of seed mixes will work with them, and some even offer suet cages for more food variety. We like to use sunflower hearts, as there is no waste or ground mess to deal with. This seed may cost a couple of bucks more, but is well worth it in the long run. The hopper bird feeder shown above is constructed of durable cedar, and holds 11 quarts of seed, it even offers two suet cages that will attract different species. These feeders are also available in recycled plastics that are guaranteed to never crack, split or fade. Whether wood or plastics, with hopper bird feeders you’ll spend less time filling and more time watching! Bird feeders of every make and model imaginable will keep your feathered friends fat and happy! Any wild bird feeders that are easy to fill and clean are the ones that will attract more birds. If it becomes a real pain to clean…you may not tend to do it on a regular basis. And this is of utmost importance to birds’ health, as disease can be spread very easily amongst the immediate population. Stoneware, ceramics and glass wild bird feeders alleviate the dreaded gnawing of squirrels, and this can be a big plus to many folks who have football teams of the critters in their yard. Another benefit of these materials is they are non-porous, which prevents bacteria and germs from settling into surfaces. Pictured are just a few fun bird feeders that are guaranteed to attract and entice feathered friends. 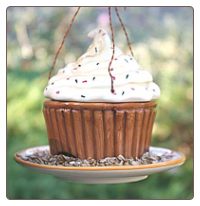 From ceramic cupcakes, to stoneware cats, these wild bird feeders make awesome gifts for any birding enthusiast or nature lover that might be on your list! Wild bird feeders make very long-lasting gifts, that actually get used everyday…now what could be better than that? There is something to be said for weathered wood, it has a character you just don’t see in new construction. Recycled barn wood has become quite popular in many home and garden items. The rustic look has wonderful appeal and blends with many styles of decorating. I remember seeing a barn wood bench in the Sundance catalog years ago that was beautiful, but out of my price range. For the garden, some artists are crafting wood birdhouses from old barn wood and fence posts. Using reclaimed items such as tin, license plates, and even materials from local junk yards, these houses have character beyond compare. Wood birdhouses with clean-outs and ventilation are meant for feathered friends and provide vital nesting and roosting spots. The Blue Roof Motel shown here is crafted from old barn wood and tin. Twelve cozy compartments each provide a great spot for wrens, finches, chickadees and other small songbirds. Also available in red, this wood birdhouse compliments just about any garden or landscape, and offers birds protection from the elements and predators too. In early spring, any number of the 12 compartments may become the perfect nest site for your feathered friends! Providing much needed nesting sites for wild birds has really evolved since backyard birding has become such a popular hobby. 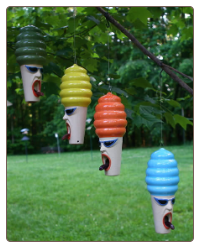 Today, decorative bird houses run the gamut from just a few bucks to hundreds of dollars for an artist’s piece of work. 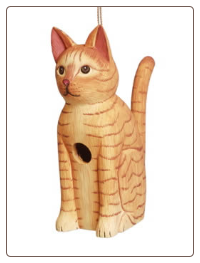 Hand made, high quality birdhouses and bird feeders that command attention while enticing and attracting feathered friends. 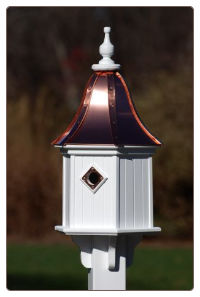 These copper roof decorative bird houses are constructed of PVC/vinyl and guaranteed to last a lifetime. Because it is the same vinyl used in the construction of people houses….you know it’s going to last. With little to no maintenance, the houses and feeders are a dream. Forget about squirrels gnawing on them, or weathers’ severe toll like their wooden counterparts. These houses and feeders are absolutely guaranteed to never crack, split or fade. One of the great things with these vinyl and copper roof houses is that each piece is made to order, so you get to choose either a bright copper, or an aged patina copper roof. The other factor is the amazing quality. 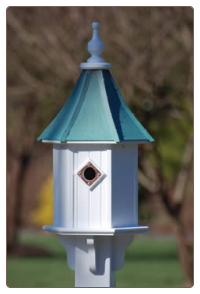 Hand crafted using a CNC router ensures absolute precision in each and every bird house and feeder. Some models are even available with a cypress shingle roof for a more rustic look. Sizes range from a six-to-eight inch diameter house for bluebirds, all the way up to a jumbo 22-inch diameter for purple martin houses – which happen to be about four feet tall! From single compartments, to twelve compartments, with copper portals or perches, there are many great designs from which to choose. 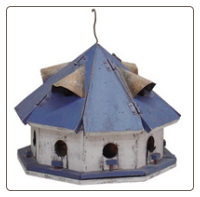 The roof shapes vary too, offering a bell, slope, or curly accent on the top of these wonderful decorative bird houses. They make an awesome and life-long gift for any backyard birder on your list! Birdhouse designs need not be boring in order to be functional. 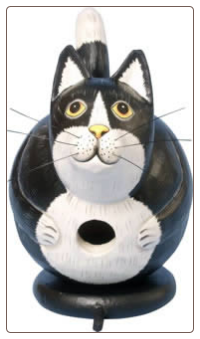 These hand carved, and hand painted funny cat birdhouses are totally fun and functional. They have trap doors, or twist off bases for yearly clean-out, proper ventilation, and they offer feathered friends a cozy and safe nesting sit e. Birds will also use houses to roost on cold winter nights, and for protection when Mr. Hawk or the neighbor’s cat visits the yard. These unique birdhouses make for excellent and long-lasting gifts, that will actually be used and enjoyed for many seasons. 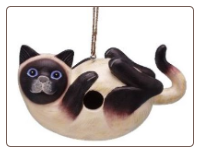 Especially for cat lovers, nature buffs and backyard birding enthusiasts will definitely get a kick out of the unique designs. Never any worries of the dreaded re-gifting with these great birdhouses. Check them out! With so many choices in wild bird feeders these days, it’s kinda difficult to decide what type to buy. There are standard hopper feeders, which tend to hold larger capacities, and platform feeders, for offering a variety of foods to birds. Fly-thru feeders are generally platforms with roofs to protect birds and food from the elements. You have suet feeders and meal worm feeders, then of course there are the popular tube feeders. Tube bird feeders are wonderful for attracting many species, but one problem with them is limited perches or feeding ports. They usually allow only a certain number of birds to feed at once. Two, four, maybe six ports on most models. The spiral tube feeders accommodate more birds, as the designs allows for the whole tube to be accessed for food. Birds love to “run” the spiral and it makes for a great show too! These spiral feeders are available for thistle seed, (or nyjer) for feeding finches, peanuts for feeding jays, woodpeckers nuthatches, and for standard seed mixes too. The powder coat construction ensures many seasons of use, by feathered friends and human hosts alike. And if you’re new to the great hobby of backyard birding, we can’t stress enough the importance of water. This is by far the best attractor for wild birds to your place. Fresh water in a bird bath will entice many more wild birds than just feeders alone. Especially in winter, a heated bath can be a life saver for many feathered friends! A wild bird accessory that does more than one job? One of the great thing about seed catchers is that they serve more than one purpose. First and foremost, they prevent ground waste, which in turn prevents weeds from popping up in the garden or lawn. This also creates a healthier habitat for backyard birds. Larger seed catchers also serve as platforms for other birds to feed on the fallen seed. Those who may not perch at the feeder itself, are apt to dine on the large, flat area. So you may end up attracting some new bird species. This large 18.5-inch seed catcher is made for a any standard one-inch diameter pole. Because of the innovative design, it also acts as a squirrel baffle, and a good one at that! 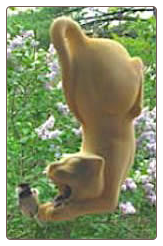 When squirrels shimmy up the pole, they can not get past the down-turned rim on the seed catcher. Like all Droll Yankees’ quality birding products, this seed catcher ensures many seasons of use and enjoyment. Bye Bye squirrels! Most folks start with birdhouses and bird feeders to attract wild birds, and this is the perfect way to explore the great hobby of backyard birding. There are many other ways to increase the number of visitors and the number of species to your yard. Water is the number one element. Many birds who never visit a feeder will frequent a yard that offers a continuous fresh water source like a bird bath. Especially during frigid winters when water sources tend to freeze and become scarce, birds depend on a known spot for fresh water. Our bluebirds even over-wintered here in North Georgia, largely because of the three heated bird baths in the yard. Oh yes, the live mealworms helped too! Many desired songbirds birds (like cardinals and finches) are not cavity-dwellers either, meaning they’ll never use a birdhouse. Which brings us to yet another feathered friend favorite. Nesting materials are extremely important to birds in early spring. With a severe shortage in natural habitats, many depend on bird-friendly yards for their residence. There are all kinds of kits which offer refills too. 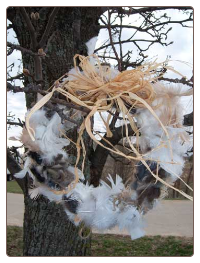 This nesting material wreath is one, complete with feathers, cotton fibers, hemp, and raffia. The Bird Nester is a large, cage-like holder for cotton fiber nesting material, and offers refills as well. Even the Hummer Helper, which is nesting material designed specifically for hummingbirds offers refills. Offering wild birds nesting materials in your yard really helps them to thrive and flourish. You can even craft your own materials using dryer lint, pet hair, cotton yarns, and mosses used in decorative floral design. Use a standard suet cage for holding the materials, or a mesh produce bag from the grocery store (like the kind apples come in). Late winter to very early spring is the best time to set them outside for birds. Simply hang from a tree branch, where they’ll be easily spotted, or even from one of the arms on your shepherd’s hook……happy birding!